Liberals point out that American health care is expensive. And they’re right. But the reason, they say, is that’s it’s private. 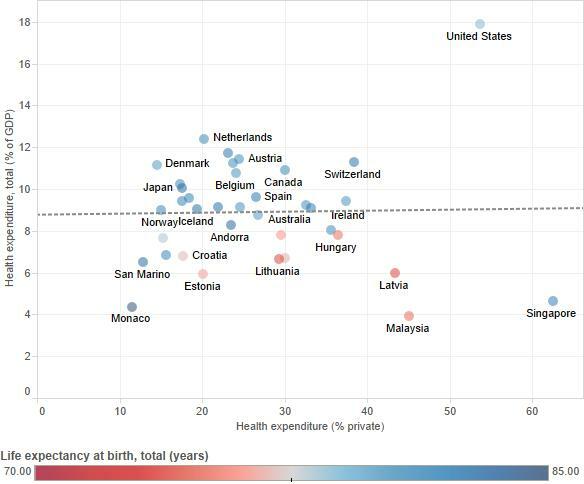 It follows that European-style single payer systems are cheaper because of government control. We shouldn’t let greed run our health care system, the argument goes. But is that really the case? 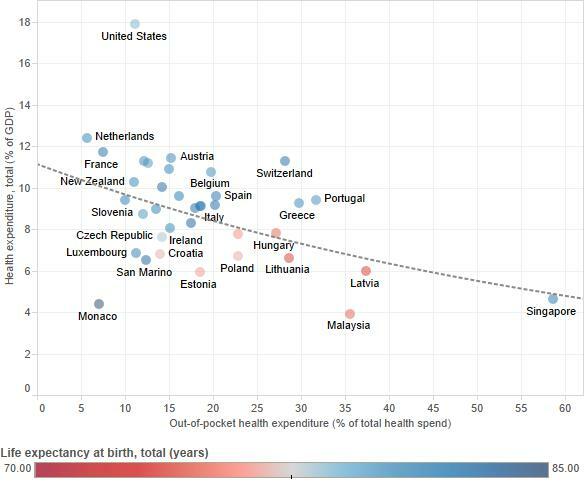 Below is a scatter plot created from 2012 World Bank data showing the relationship between private spending as a % of health care costs vs. the cost of health care overall as a % of GDP. What is the relationship? Statistically, there’s no relationship at all. The United States and Singapore stand out as the most “private”, though America’s system is very expensive and Singapore’s very cheap. Both are outliers. What happens when we exclude them? Not much. There looks to be a somewhat negative correlation between the variables, but the relationship is still statistically insignificant. Let’s look at a different variable than % private. When looking at % of GDP spent on health care vs. % spent out of pocket, we finally get a significantly negative correlation. The more you force the market mechanism onto health care consumers by making them spend out of pocket, the less they will spend as a % of GDP. This makes sense as out-of-pocket expenses will respond to prices. What does not make sense is that the US “market” system has a relatively low out-of-pocket expense ratio. We call our system capitalist, market oriented. But the most important part of any market is price. Facing the actual price of a service forces us to value it accordingly, so that we can adjust our consumption to the “right” amount. 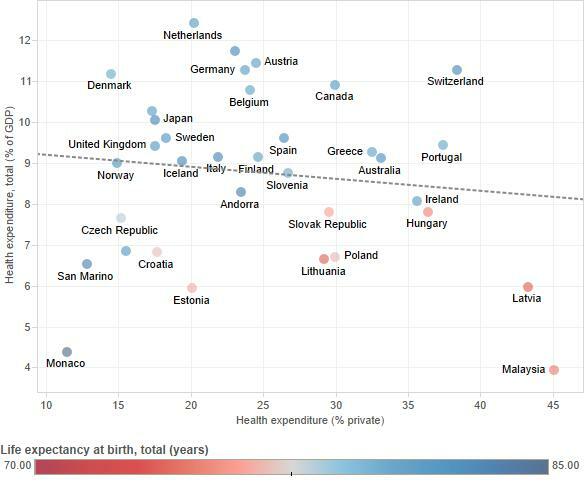 How strange that in “socialist” Belgium, you pay 20% of health care out of pocket whereas in “capitalist” America, only 11%. The lack of any meaningful out-of-pocket expenses in the American system means that US consumers of health care have no incentive to buy less, or more efficiently. Private companies (hospitals, drug makers, device manufacturers) know that price is always dealt with through an intermediary (insurance), so they can charge whatever they want. Eventually premiums rise for everyone. America has the worst of both worlds: a socialist price mechanism with private companies taking advantage of it. Instead of becoming more like Europe, which tames prices more through more explicit government control of health care, we should instead try schemes like Singapore’s to allow market mechanisms to work.